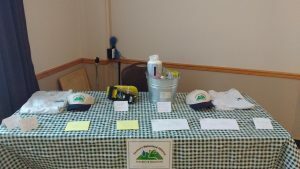 In mid-March, the Farmer’s Watershed Alliance held its 11th annual meeting. We are continually grateful to all the agricultural leaders who take time out of their busy schedules to meet with us. In particular, we would like to recognize Secretary of Agriculture Anson Tebbetts, Deputy Secretary Alyson Eastman, Senate Committee on Agriculture Chair Bobby Starr, ARM Deputy Director Laura DiPietro, DEC Assistant Program Manager and Water Quality Specialist Marli Rupe, Senior Agricultural Development Coordinator Ryan Patch, Champlain Valley Farmer’s Coalition Board Member Lorenzo Whitcomb, New England Dairy Promotion Board Public Relations and Communications Specialist Laura Hardie, VAAFM Agricultural Water Quality Specialist Maria Steyaart, Zone District Conservationist Corey Brink, and Vermont Dairy Producers Alliance Amanda St. Pierre and Bill Rowell. And of course, a big thank you to everyone who joined us for an evening of sponsorship by Cargill, Oliver Seed, Fiske Insurance Agency, Northwest Veterinary Associates, St. Albans Coop, Tractor Supply, Harvest Equipment, and Claude Fortin! Below are some highlights from the annual meeting. The Chair of the Farmer’s Watershed Alliance, Darlene Reynolds, welcomes everyone. FWA Board Member Scott Magnan speaks about the diversity of manure application methods and no-till practices FWA board members utilize. FWA Technical Assistance Provider Jeffrey Sanders presents on the increased acres of cover crops FWA board members have planted. 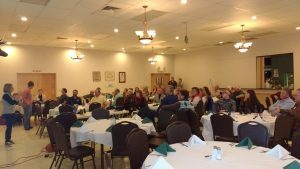 Dairy Promotion Board Public Relations and Communication Specialist Laura Hardie shares a video she made on the importance and use of cover crops on Vermont Farms. Secretary of Agriculture Anson Tebbetts recognizes the economic importance of dairy in Vermont, the hard work dairy farmers do, and his optimism for the future of agriculture in Vermont. ARM Deputy Director Laura DiPietro shares VAAFM program opportunities and what to expect from VAAFM this year. Chair of the Senate Committee on Agriculture Bobby Starr reaffirms his commitment to working with Vermont agricultural producers. FWA Chair Darlene Reynolds thanks Secretary Tebbetts for his leadership in Vermont agriculture.